The Eco Xtreme Adrenaline will not only satisfy your thirst for adventure, it will treat you to the top destinations found in Costa Rica. Even more awesome than it sounds, it is this writer's favorite. You’ll be whitewater rafting and canyoning waterfalls by day while in the verdant rainforest area of Arenal Volcano, then unwinding at night soaking in soothing volcanic hot springs. 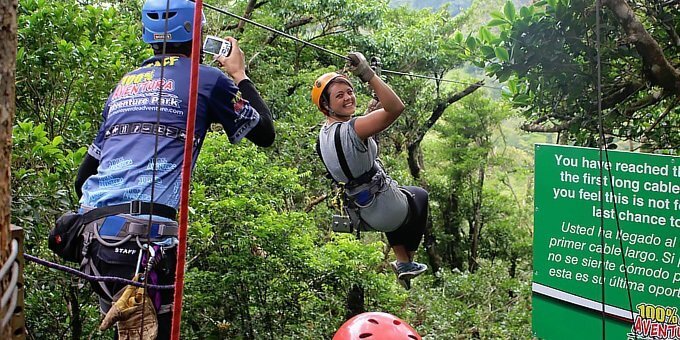 On to the high mountainous region of Monteverde, you’ll blaze trails on a radical cross country ATV ride and soar by assorted ziplines through the giant trees of the majestic cloud forest canopy. From there you’ll hit the beach to learn some surfing moves at Manuel Antonio on one of the world’s most beautiful beaches where you can also enjoy finding exotic wildlife. As with all our trendsetting vacations, this value-packed itinerary can be 100% customized to fit your budget and personal preferences. Check pricing notes for details. Take Advantage of Green Season Discounts! 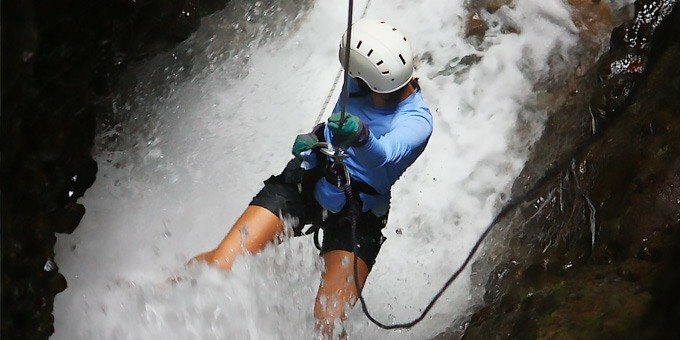 Eco Xtreme Adrenaline combines awesome adventures, amazing destinations, comfortable lodging, and total transportation in one easy to do epic Costa Rica adventure vacation! If you’re a thrill seeker, put this trip at the top of your list! Did we mention that it is fully customizable to your preferences and budget? You read that right, you can trick out this itinerary to make it your perfect dream vacation. 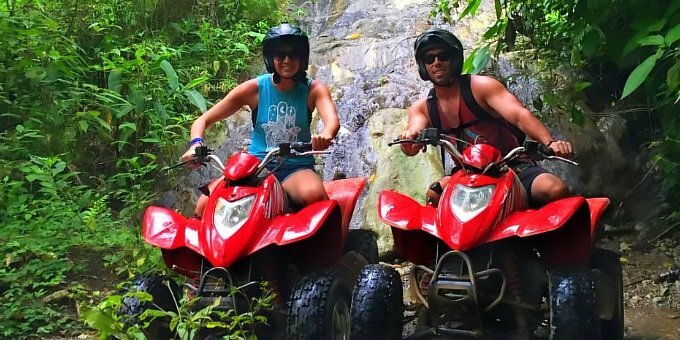 Eco Xtreme Adrenaline combines awesome adventures, amazing destinations, comfortable lodging, and total transportation in one easy to do epic Costa Rica adventure vacation! If you’re a thrill seeker, put this trip at the top of your list! Did we mention that it is fully customizable to your preferences and budget? You read that right, you can trick out this itinerary to make it your own personal dream vacation. Your trip kicks off when we greet you as you arrive at the San Jose International Airport. Afterward, we’ll provide a private transfer to the small village of La Fortuna located at the base of Arenal Volcano. Lively and colorful, La Fortuna is known as the epicenter of adventure in Costa Rica! Surrounded by tropical rainforest, this area offers more ecotourism activities than any other destination as well as having the best selection of hot springs and adventure tours. Arenal Springs Resort and Spa will be your home base while discovering all the excitement of the beautiful region. You’ll stay in the Junior Suite which provides a spacious room and bath plus patio. This eco-resort has fabulous volcano views from every bungalow and onsite thermal hot springs. Over the next couple of days, you’ll go on a wild whitewater rafting ride over Class II and III rapids down the awe-inspiring Rio Balsa and on to an epic canyoning and waterfall rappelling tour deep in the heart of the jungle! Be sure to set aside time to soak in the resort’s comfortable hot springs after your adventurous days! Monteverde Cloud Forest is next up on the list. To get there, you’ll be taken by van to Lake Arenal where you’ll enjoy stunning scenery as you cross the beautiful lake by boat. 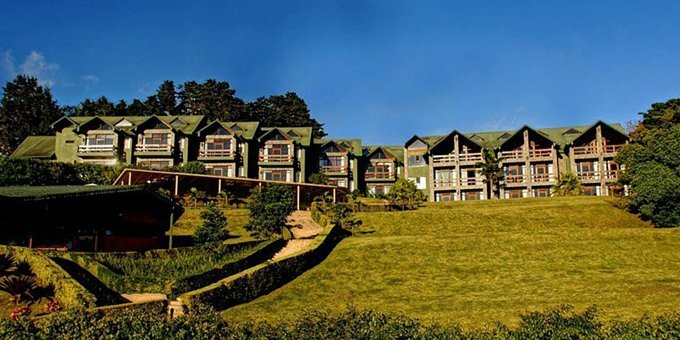 On the other side, you’ll continue by land transfer up into the mountainous region of Monteverde. You’ll stay at the El Establo Mountain Hotel, offering an authentic Costa Rican mountain lodge experience with onsite amenities including a heated swimming pool, work out gym, tennis courts, and great restaurants. Your room will be the Deluxe, spacious with high ceiling and large picture window, including mini-fridge and coffeemaker. During the next two days high up on the Continental Divide, you’ll go soaring by zipline over the unique cloud forest landscape and on a high-speed ATV adventure exploring the scenic mountainous countryside. After a few days in the high altitude cloud forests of Monteverde, you’ll undoubtedly be ready for some fun and sun at the beach! A transfer will be provided that will take you down the mountains and over to the beautiful Central Pacific coastal town of Manuel Antonio. This area is world renowned for its beautiful beaches, abundant tropical wildlife, and spectacular juxtaposition of jungle and shoreline. You’ll stay at the Shana Hotel, positioned on the hills above the small beach town of Manuel Antonio. Your room will be the Standard, including a/c, wifi, coffee maker, and private patio with jungle or garden view. The next day, you’ll take a professional surf lesson and then the remainder of your time you can spend relaxing at the beach until it is time to return home. If you’d like to add additional activities while in this area, we can help you easily customize your itinerary. It should be noted that the Eco Xtreme Adrenaline adventure isn’t for everybody as it designed for those reasonably fit seeking adrenaline pumping outdoor activities. You’ll need to be at least 16 years old and able to present a valid drivers license to drive an ATV. Day 1: Welcome to Costa Rica and on to Arenal Volcano! After your meet and greet at San Jose Airport, we’ll provide a private transfer to the town of La Fortuna at the base of Arenal Volcano. You’ll stay at the Arenal Springs Resort and Spa, which offers onsite hot springs. 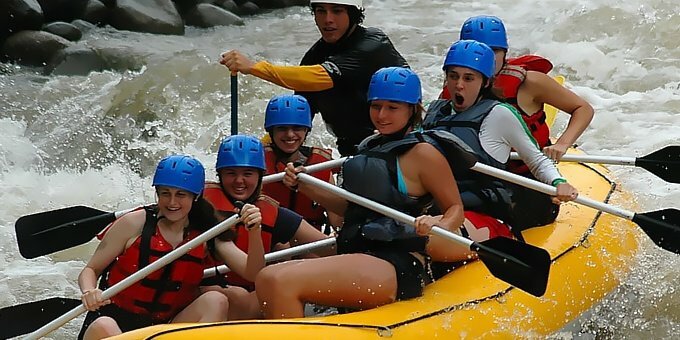 You’ll go whitewater rafting on Class II and III rapids down the exciting Balsa River. After rafting, lunch and a cultural exhibition will be provided at a nearby local farm. Get ready to scramble through a rainforest canyon and rappel down the waterfalls on today’s awesome adventure! You’ll be ready to soak in the resort’s comfortable hot springs after your Herculean effort! Today a van will take you to Lake Arenal where you will board a boat to cross the beautiful lake before continuing on the other side, by land, to get to Monteverde. You’ll stay at the El Establo Mountain Hotel for the next few days. Today’s Aventuras Canopy Zipline course is one of the best in Costa Rica! It includes 11 exciting zipline cables and a giant Tarzan Swing! Get revved up for today’s high-speed ATV ride through Monteverde’s mountainous back roads, cloud forest, and scenic open vistas! 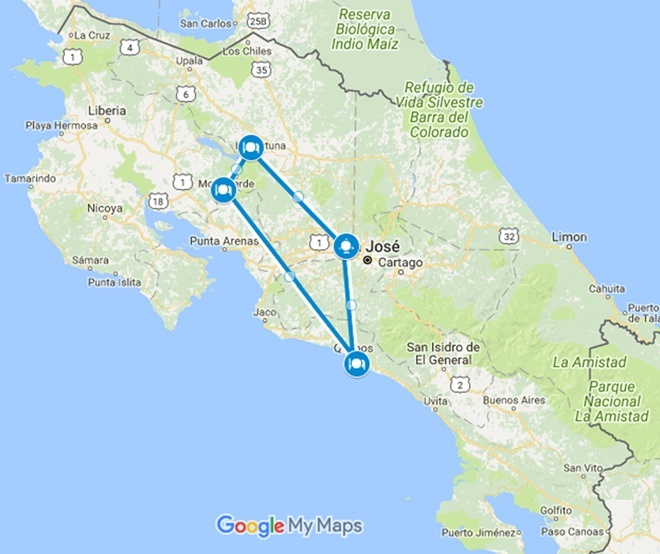 A transfer will be provided to take you down from the mountainous Monteverde region and over to the Pacific coastal town of Manuel Antonio. You’ll stay at the Shana Hotel to enjoy time at the beach for the next few days. Whether you’re a first-timer or an old pro, today’s surf lesson will have you learning some smooth moves riding your board across the ocean waves! Today is your day to take some time to relax and just unwind at the beach. Or, enjoy the Shana’s poolside lounge area, have a cool tropical drink, and take in the view. We’ll provide a private transfer back to the San Jose Airport based on your flight itinerary. Low Season 2018 rates start at $1,219 USD* per person double occupancy, $1,093 USD* pp for triple occupancy, or $2,072 USD* pp for single occupancy for the lodges listed above. High season 2019 rates start at $1,463 USD* per person double occupancy, $1,317 USD* pp for triple occupancy, or $2,561 USD* pp for single occupancy for the same lodges. Low Season 2019 rates start at $1,385 USD* per person double occupancy, $1,256 USD* pp for triple occupancy, or $2,404 USD* pp for single occupancy for the same lodges. You can upgrade or downgrade hotels to match your preferences and budget.